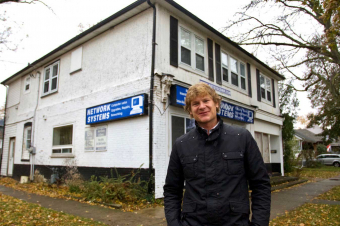 Karl Vanderkuip has noticed something’s missing along Russell Avenue in St. Catharines. The street that carves a swath through the city’s midtown is home to a community centre, apartments for seniors, a convenience store, and even an appliance shop. But what the long residential street set between Welland Avenue and the QEW doesn’t have is a neighbourhood spot to go for a bite with family and friends, or to grab a coffee to unwind. Vanderkuip wants to change that as the new owner of a mixed-use building carved into apartments on the corner of Russell and Wolseley avenues. He has visions of renovating the tired, white-sided two storey, keeping apartments up top and turning a former main-floor computer repair shop into a 144-square-metre, 30-seat restaurant. An 81-square-metre joint with room to add a street-level apartment is also an option. Vanderkuip envisions a space like The Butcher’s Daughter, the highly Instragram-able New York and Los Angeles cafes with exposed brick and high ceilings. Something with the neighbourhood feel of bakery where first names are exchanged with regulars stopping in for loaves and sweets. As he points to architect’s drawings that show an updated, sided facade with large windows that could open to create a patio feel, he admits he needs a tenant to make it happen.